Globecast to show its live video production solution at CABSAT in Dubai. Paris, February 2019: Globecast Live is to make its show debut at next month's CABSAT held in Dubai. Globecast has combined its live content acquisition expertise with its Digital Media Hub cross-platform suite of content publishing services for sport and live events, creating a turnkey live content solution from any event to any screen. 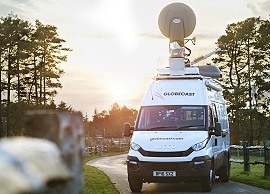 Globecast Live works for both the broadcast and B2B communication markets, creating live content TV suitable for: intranets, extranets, social media, short- and long-form VOD, linear broadcast and OTT services. Content can be stored and made available for later use via Globecast’s Content Marketplace. CABSAT takes place at the Dubai World Trade Centre on 12-14 March 2019. Globecast will be in Hall 7, C7-20.